To put an end to the twin menace of open garbage dumping and public urination, the GVMC has come up with an innovative idea of drawing rangolis at such places. 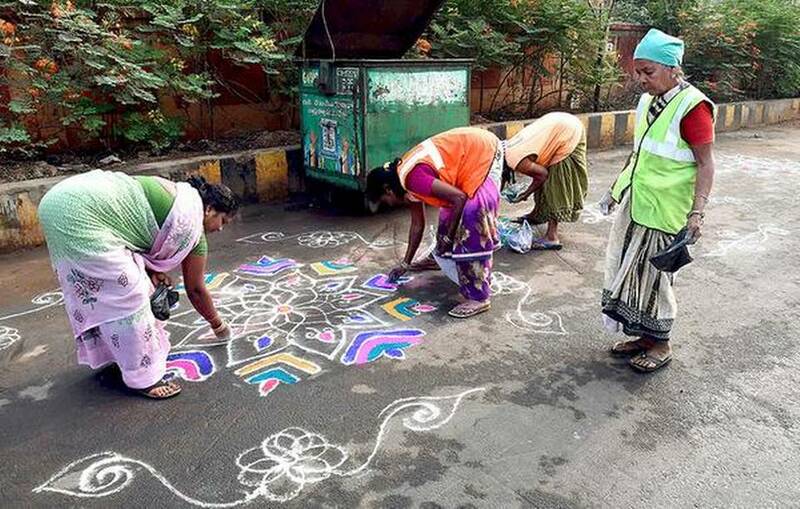 On Tuesday, sanitary workers drew colourful rangolis on the road at vulnerable areas in Thatichetlapalem area of Zone I. The initiative by the civic body seemed to pay off, with motorists and passers-by halting to take pictures of the rangolis. Though we place dustbins, some people dump waste on the roads. Moreover, in some places, we notice people urinating in the open. To put an end to this issue, we came up with the idea of drawing rangolis. Maybe via this initiative, people will realise the importance of keeping the city clean,” said Zonal Commissioner-I Sanyasi Rao. Similar initiatives were taken up by the Greater Hyderabad Municipal Corporation (GHMC) in the past, where officials hired people and gave them whistles and even came up with the initiative of Gandhigiri, where people urinating in the open were garlanded, in an attempt to embarrass them. Even in Benguluru, many resident welfare associations have taken similar steps to prevent the public from urinating in residential areas. Apart from rangolis, we have also taken up plantations to stop public from urinating. The GVMC also painted murals on walls at many such areas to make sure the public does not dump or openly urinate,said GVMC Commissioner M. Hari Narayanan.